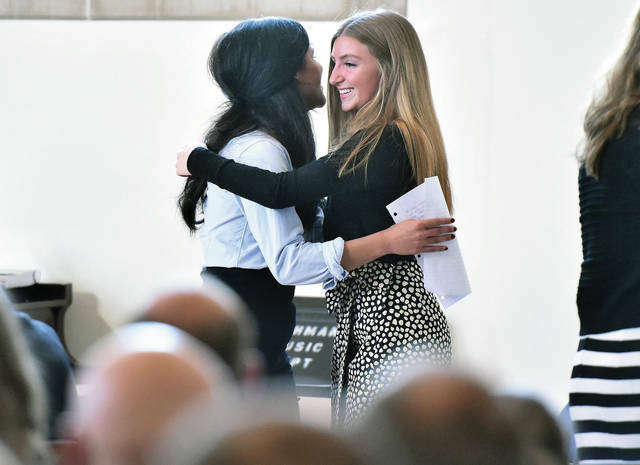 Kaila Sims, left, 18, daughter of Angela Foster, hugs Lisa Adams, 16, both of Sidney, daughter of John and Tara Adams, as Adams is inducted into the Lehman Catholic High School Honor Society during a ceremony Sunday, Jan. 27. Sims read a speech about why Adams was deserving of induction. Each Lehman student that was inducted had a friend or relative read a speech.